Hi all! Lorene from just Lu back again with another fun Doctor Who tutorial for you! 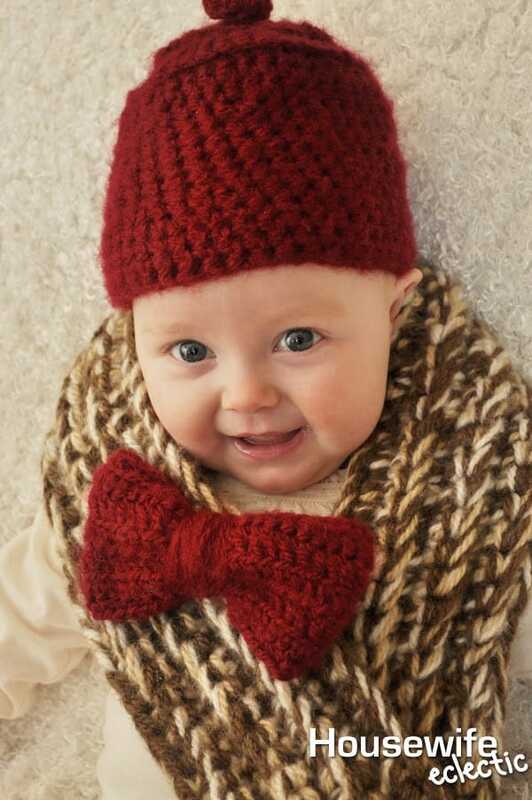 Bowties are cool, and what’s cuter than a baby 11th doctor! The bowtie is removable, so you can easily adjust the scarf to wear yourself, too, for a little bit of understated Whovian cosplay style… if there is such a thing. Using the red yarn and smaller crochet hook, crochet a rectangle about 6 inches by 3 inches (for an oversized baby bowtie or an average sized adult bowtie). Start with a chain foundation to the correct width, and then make rows of single crochet to the desired height. 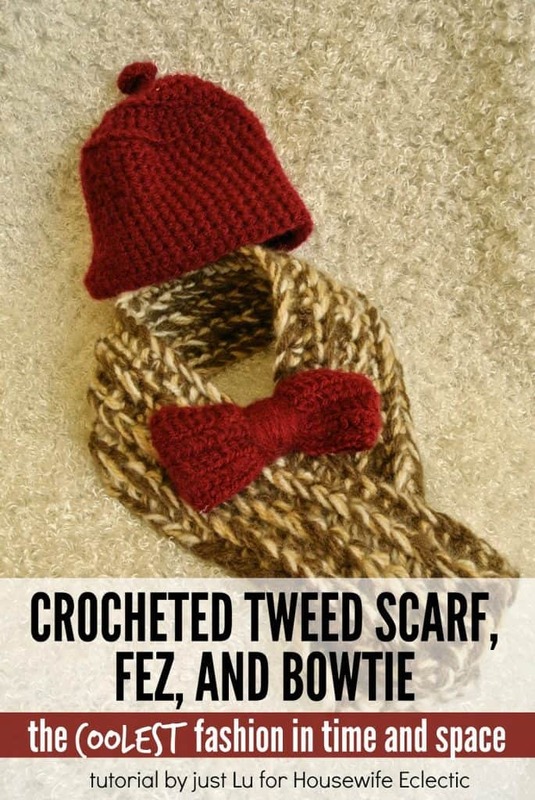 Tie off the crochet, and then pinch the rectangle in the middle and wrap it with yarn to form the knot of the bowtie. Using extra yarn and the large needle, attach the button loosely to the back of the bowtie. The button has to be loose enough to button through one layer of the scarf, which will be about half an inch thick or more, depending on the thickness of the yarn you are using. Using 4 strands of yarn (I used 2 of the darker brown, 1 tan, 1 cream) and the jumbo crochet hook, chain a foundation row to the length that you want the scarflet. Mine is about 30 inches long, give or take. Then crochet single crochet rows to the width that you want — mine was about 5 inches, 4-5 rows. Tie off the ends and attach the second button a few inches from the end, so that you can use it to secure the scarf around your neck. You can’t be the 11th doctor without a fez! I winged this one and didn’t write down the pattern, but you can check out this free pattern or this one to make one of your own. Nice looking scarf and hat.. nothing like homemade.. This is shnazzy! Love it! Wish you had more pictures though but I love how it turned out! Oh I love the bow-tie on it! Very cute! That scarf is awesome and that bowtie makes it. I've never been able to get into Doctor Who, I gave an episode a try and it wasn't my thing. Sharing this with my friends who love to crochet! That has to be one of the cutest things I've seen! Going to share with my photography friends. Love that crochet is coming back. My mom taught all three of us kids (one is even a boy) and it is something we still do today. I giggled when I saw the bow tie. I am going to have to give that a try. I love scarves in the winter time. I wear them all the time. It gets cold here! So cute! I wish I had the gift to do things that like this! I thought it was cute. Then I scrolled down and saw the little one in it, and oh oh oh oh it's cute! Oh my word, that is too cute for words! Loving this. Wow what a nice crochet job. Thank you for sharing! This is cute! Oh. Em. Gee. How cute is that and what a cutie pie, too! That is just the cutest idea. It sure looks adorable on the little model too. Oh my goodness that is too cute! I love dressing up babies for photoshoots. What a cute scarf and hat. The colors blend really good. I don't crochet but a friend of mine will love this procedure you shared. you are very talented! Love the bow tie!